When Ferris Babcock Dove (1915-1983) and Eleanor Dove (1918-present) opened the Dovecrest Restaurant in 1963, it was the first Native American restaurant in New England. 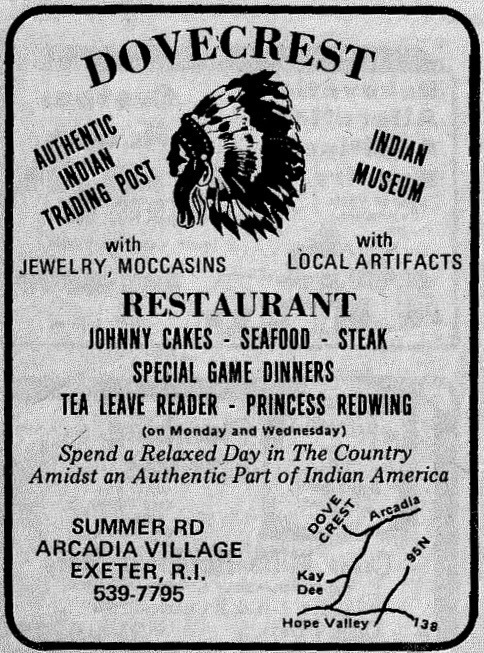 Perched on Summit Road, the restaurant gained national attention for their Indigenous cuisine, including johnnycakes, succotash, as well as more unique dishes like racoon pie, bear, moose, and venison stew. The restaurant remained a fixture in the community for 23 years. In 1969, Princess Red Wing and the Dove family moved the Tomaquag Museum beside the restaurant, to better share Narragansett culture with the restaurant's patronage. Ferris, also known as Chief Roaring Bull, graduated from Westerly High School and Bacone College in Oklahoma, formerly known as Bacone Indian University. He was a member of the National Guard and a supervisor at Electric Boat. Ferris was also the first Native American postmaster, serving for many years at the Rockville post office and as the President of the Rhode Island branch of the Postmasters League. 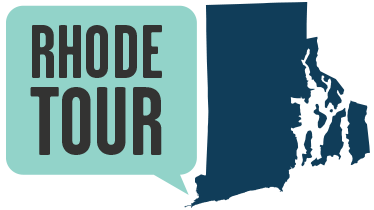 Ferris was also active in the town of Exeter, serving as the town moderator and tax assessor for a multitude of years. Ferris was also very involved in Tribal affairs throughout his life. He was the last traditional war chief among the Narragansett Tribe, earning this title through physical and mental feats and performing good acts for the community. He held this role until his death. 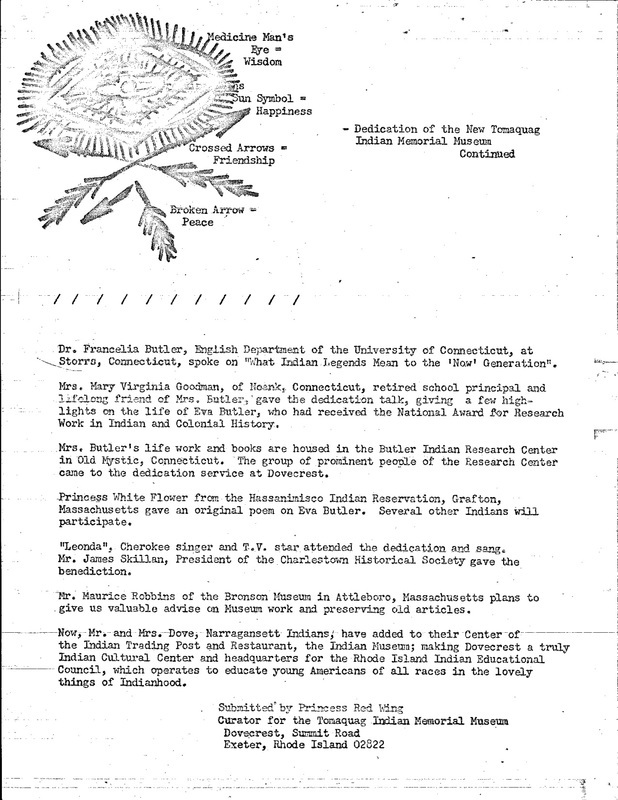 Ferris also played a critical role in his Tribe's fight for federal recognition, testifying before Congress during the federal recognition process in the 1970s. Ferris died shortly after recognition was granted in 1983. The Dovecrest Restaurant was sold in 1984 and closed its doors forever in 1986. Eleanor (Spears) Dove, or Pretty Flower, was born in 1918, growing up in, what was then, rural East Providence. In her youth, Eleanor modeled, worked as a caterer, and in a family restaurant. She met Ferris at a dance in East Providence, where she told her cousin, "I'll take the tall one." In 1938 she and Ferris were married at the Narragansett Indian Church. They raised four children in Charlestown prior to purchasing their homestead in Exeter, which became Dovecrest. Eleanor was an active member of the Narragansett in her own right. Along with being head chef and manager of the Dovecrest, for years she was involved in the Business Professional Women's Foundation, the March of Dimes, and the Narragansett Indian Church Board. Eleanor turned 100 years old on August 1, 2018. Her most important role is mother, grandmother, mentor, and role model to many throughout the Native and non-Native community, a testimony she shared at her 100th birthday celebration. Although the Dovecrest closed over 30 years ago, the locale is still special to the Narragansett community. 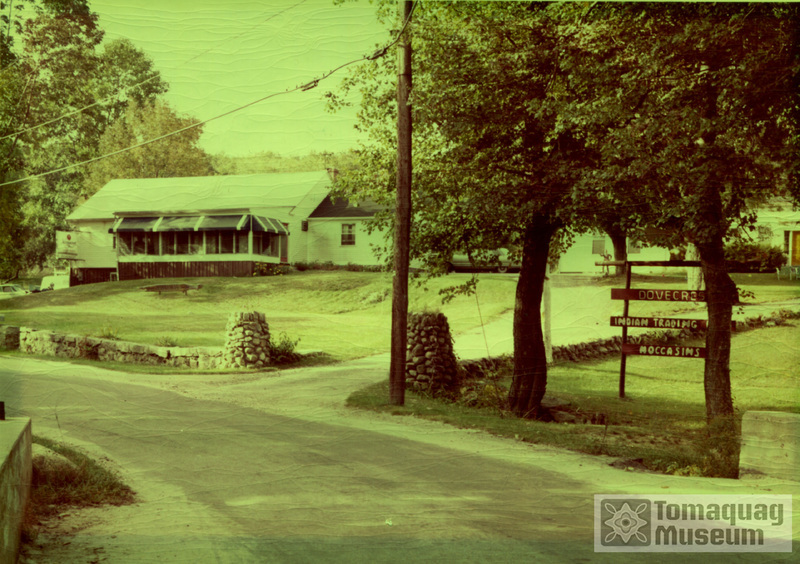 Next to the building, the Tomaquag Museum remains open and more active today than ever. The adjacent Nuweetooun School was opened in 2003, educating Narragansett and other children for seven years. The school was headed by Lorén Spears, Ferris and Eleanor's granddaughter, who has served as the Executive Director of the Tomaquag Museum since 2003. 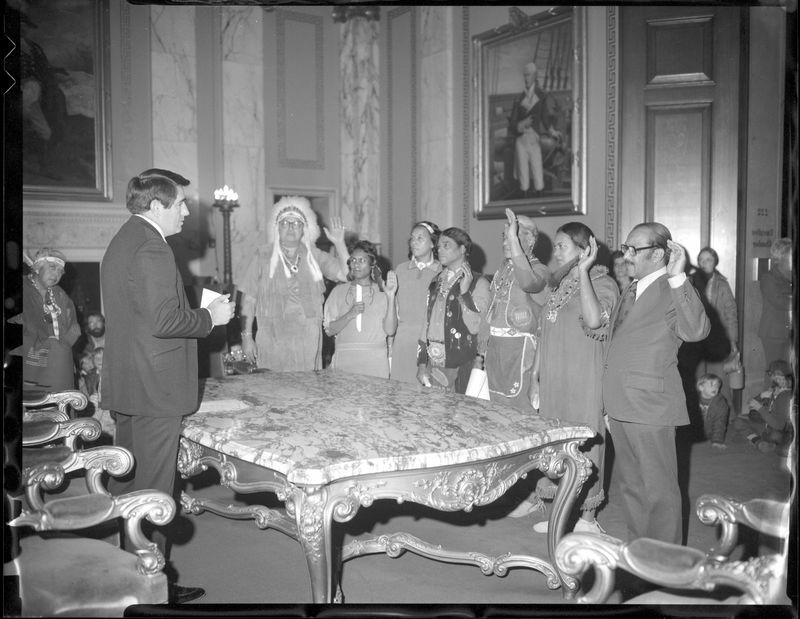 Governor Noel Swears in Members of the Commission for Indian Affairs: Governor Noel swears in members of the newly established Rhode Island Commission for Indian Affairs, November 10, 1976. Commission members included: William "Big Toe" Wilcox of East Providence, Garrison E. Parker of Providence, Frederick C. Williamson of Providence, Nancy Hazard Padron of Kenyon, Emaline Thomas Colbert of Kingston, Ethel "Sis" Brown of Bradford, Ferris Dove of Exeter, and Reginald Eleazer of Westerly. 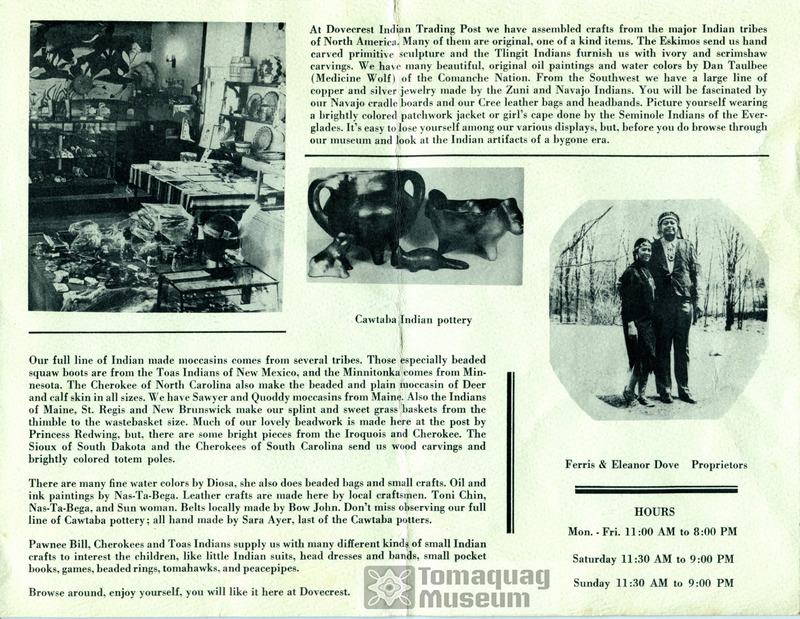 Dovecrest Brochure Featuring Ferris and Eleanor Dove: This Dovecrest brochure from the 1970s highlights the unique offerings of the Trading Post and Museum, an attraction for restaurant patrons. The Dovecrest Resaurant: Here is a view of the Dovecrest Restaurant atop Summit Road in the 1960s. The Dovercrest on Congressional Record: Ferris and Eleanor Dove's restaurant, the Dovecrest, was entered into the Congressional Record in 1981 shortly after the New York Times spotlighted their establishment and its unique cuisine. Dovecrest Advertisement, 1977: The Dovecrest highlights its more notable menu items, including Johnny Cakes and game dinners. 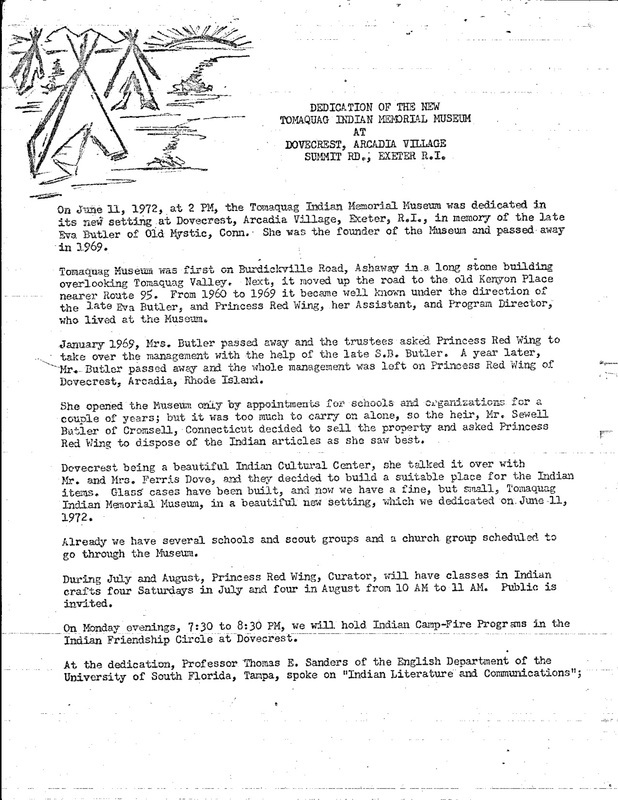 Tomaquag Museum Rededication Page One: The Tomaquag Museum moved from Ashaway to Exeter and was rededicated in its current location on Summit Road in 1972. Princess Red Wing oversaw the museum and lived with the Dove family who ran the Dovecrest on the same property. Tomaquag Museum Rededication Page Two: The Tomaquag Museum moved from Ashaway to Exeter and was rededicated in its current location on Summit Road in 1972. Princess Red Wing oversaw the museum and lived with the Dove family who ran the Dovecrest on the same property. The location of the original Rockville Post Office can be visited at Wincheck Pond Road in Rockville. 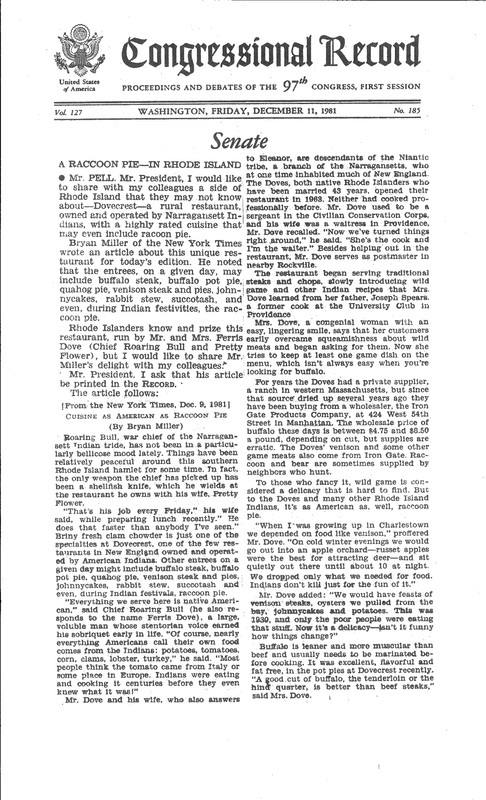 You can read the original 1981 New York Times feature on the Dovecrest that was included in the Congressional report here. Katharine Kirakosian and Tomaquag Museum, “Ferris Babcock Dove and Eleanor Dove,” Rhode Tour, accessed April 21, 2019, http://rhodetour.org/items/show/301. Davina, Fernando and Marlene Davina. (2010) Foods of the Americas: Native Recipes and Traditions. Ten Speed Press.